As the first title in the new series, New Directions in Communication Disorders Research: Integrative Approaches, this volume discusses a unique phenomenon in cognitive science, single-word reading, which is an essential element in successful reading competence. Single-word reading is an interdisciplinary area of research that incorporates phonological, orthographic, graphemic, and semantic information in the representations suitable for the task demands of reading. Editors Elena L. Grigorenko and Adam J. Naples have organized a collection of essays written by an outstanding group of scholars in order to systematically sample research on this important topic, as well as to describe the research within different experimental paradigms. Single-Word Reading provides an introduction to unfamiliar areas of research, and is an inspiration for future study. The introductory chapter sets up a contextual stage for connections between spoken and written word processing, the stage-based nature of their development, and the role of education. Succeeding chapters address visual word processing; the role of morphology in word recognition; the role of lexical representation; the biological bases of single-word reading and related processes; and more. Reading researchers will take interest in this substantial book, as will professionals and practitioners linked to the teaching of reading in the departments of school psychology, special education, communication disorders, neuroscience, cognitive science, linguistics, and reading. R. Paul, Foreword. E.L. Grigorenko, Introduction. P.H.K. Seymour, Continuity and Discontinuity in the Development of Single-Word Reading: Theoretical Speculations. T.A. Nazir, A. Huckauf, The Visual Skill of “Reading”. U. Maurer, B.D. McCandliss, The Development of Visual Expertise for Words: The Contribution of Electrophysiology. U. Goswami, Phonological Representations for Reading Acquisition Across Languages. L.B. Feldman, D. Basnight-Brown, The Role of Morphology in Visual Word Recognition: Graded Semantic Influences Due to Competing Senses and Semantic Richness of the Stem. L. Hart, C. Perfetti, Learning Words in Zekkish: Implications for Understanding Lexical Representation. J. Grainger, J.C. Ziegler, Cross-Code Consistency in a Functional Architecture for Word Recognition. B. Kessler, R. Treiman, J. Mullennix, Feedback Consistency Effects in Single-Word Reading. T.C. Pollo, R. Treiman, B. Kessler, Three Perspectives on Spelling Development. J.M. Keenan, R.S. Betjemann, Comprehension of Single Words: The Role of Semantics in Word Identification and Reading Disability. P.G. Simos, R. Billingsley-Marshall, S. Sarkari, A.C. Papanicolaou, Single-Word Reading: Perspectives From Magnetic Source Imaging. R.K. Olson, Genetic and Environmental Influences on Word-Reading Skills. C.L. Barr, J.M. Couto, Molecular Genetics of Reading. E.L. Grigorenko, Four “Nons” of the Brain-Genes Connection. S.B. Piasta, R.K. Wagner, Dyslexia: Identification and Classification. J.M. Royer, R. Walles, Fluency Training as an Alternative Intervention for Reading-Disabled and Poor Readers. S.J. Frost, R. Sandak, D. Moore, G.D. Porta, J.G. Rueckl, W.E. Mencl, K.R. Pugh, Neurobiological Studies of Skilled and Impaired Word Reading: An Update and Synthesis. J.S. 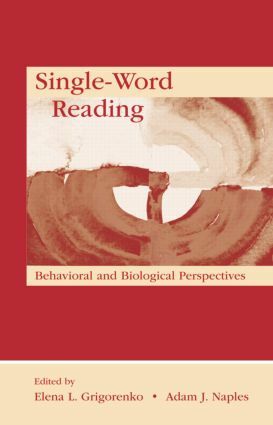 Magnuson, Nondeterminism, Pleiotropy, and Single Word Reading: Theoretical and Practical Concerns.